information in the coming weeks. 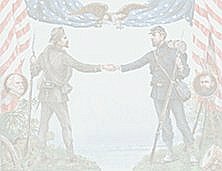 On these pages, it is my intention to give a complete history of the Civil War, as well as the genealogies of the men and women whose lives were so drastically affected. The project will be divided in several ways, but it shall be my endeavor to make it as easy to navigate as possible. Some of the material, that is county specific will be located by state and county. There will be various categories located on the site as well, different projects that are pertinent to the entire War. Over the course of centuries people come and go, but their histories remain. This site is devoted to finding that information and making it available to researchers. If you would like to donate the story of a soldier or his family or the events of this War, please feel free to contact me. I am also looking for volunteer's to do look-ups in each county, if you are interested let me know. Copyright ©2000, 2001, Debbie Axtman, Jim Powell, Jr., Jan Philips, and Brenda Hare, for the exclusive use and benefit of The American History and Genealogy Project. All rights reserved. Thanks to Ginger for the original design of this page. ©2013 This site was created by Katy Hestand and first published 15 May 2003. All rights reserved. You are free to copy information for your own personal use. It may not be published in any form for commercial gain.